Ability to like items on a friend's feed. Or comment on them. Like when they start watching a show you really really love and you want to talk to them about it. Add a Christmas/Holiday genre to the movie recommendation area. The first thing I want to do after signing up is to add all the shows and movies I've seen. This isn't really accommodated very well with the current flow. I would expect the option to view all movies in the db (with various sort options - alpha numeric at least). I'd also really expect the option to hide all movies I've seen from all search results (featured, trending, full list, etc.) to help me get it done. Since I'd want to add literally thousands of movies to my Seen list (valuable data that you want me to enter), you should be helping to make that as painless as possible. We plan to improve the new user experience to help streamline this flow. Often times, I don't watch movies or TV shows alone, but with friends. It would be nice, if only one person would check into a movie/show and mark the others. That way you could not only track which shows/movies you have watched, but also with whom. What do you say about a list called "My Top 10" that every user has by default. The max count of items on that list is 10, no more. Use case could be a page like http://trakt.tv/movies/popular where the most favored items of all trakt members are displayed. This way we could narrow the many thousend of popular items to a top 100. Interesting idea and something we plan to look into and see if it fits in with the site. The given navigation elements are: "Personal" "Official" "Watchlists" "All" - of all members of trakt. On those pages it would be fantastic to filter JUST the list of friends (or people I follow) - so I could see if he/she already has it on his/her watchlist or any personal list. That way I don't have to recommend it anymore, when he/she knows it already. Great idea, will add better filtering so it will show all users (what it does now) or your friends. I wonder if would be good a main page with news related to series or movies, news in general so we can use trakt for something more than just selecting what we see.. to use it like a real and trustworthy entertainment website. Perhaps with a section dedicated to detect series that you've seen or are in your watchlist, so that you go there knowing that you'll read something of your interest. A good idea, but the hard part is where do we get that data. Is there an API to get that info and look it up by IMDB or other ids? When browsing the dashboard or home page on trakt, I occasionally find some interesting movies or TV shows that I would like to preview. I thought it would be neat and convenient if a user can hover over a poster of a movie or TV show, and be able to view a trailer straight from trakt without having to search for it on youtube or through some other media source. Bascially if a user, hovers over the poster and clicks play, a pop out embedded video of the trailer would start playing. Maybe its an idea to show more statistics on shouts and reviews of Trakt users. For example the total amount of shouts can be shown a Trakt user has made and the total amount of likes for all the shouts someone has received besides the likes on the currently displayed shout or review. Give us the ability to tag movies, series and episodes in our collection, using tags. Tags can be marked as private, seen by friends or been public, like it's happening with lists. Tags can also have their own unique custom color and can be manipulated through Trakt's API. 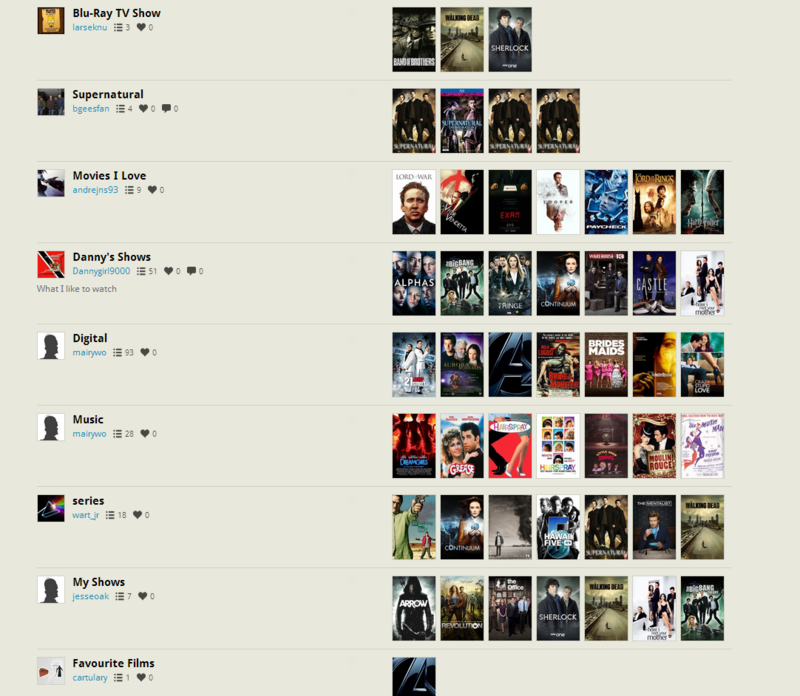 An example would be to tag some movies for their location in user's library, i.e. in HDD #3 or in BluRay #41. If someone want to do the above example now, using lists, s/he would end up having an enormous number of lists. Another example would be to indicate the format (i.e. HD, 3D etc.) or if they have subtitles and/or commentary track. Possibilities can be limited only by imagination. Right now when you're looking for community lists you have to options to choose: Popular and Favorites. Since favorites are mostly good lists (of public interest), many of the other user lists are hardly worth anyone's time or a not supposed to be for the community but for their friends. Example for this: http://i.imgur.com/fZ0IF.png. To ease to process of finding some lists or what you're actually looking for categories would be a big improvement. These could then be chosen when creating a list. - Recommendations / Things you would recommend to your friends etc. I was wondering if it's possible to get the Writer/Director information from TV-episodes over to trakt. Right now those are missing on the people page. Maybe connecting the show and an episode count would be enough? TV-directors just get left off the site. But many well known film directors like Spielberg, Scorsese, Tarantino, Cameron, Hitchcock, J.J. Abrams and Lynch have had their hand in TV aswell (without credit on the site). Anthology series are another thing where this would be great.